The astrogeographic position of Islamabad and governments of Pakistan. Astrology & astrogeography: transits of the outer planets in relation to the capital & government. On 25 November 2017 social media and several TV stations in Pakistan were blocked through a decision of the Pakistani government after “blasphemy” clashes in the capital Islamabad. Accusations of “blasphemy” are used as a propagandistic trick in pseudoislamic fascism to indoctrinate the society, create fear, suppress individualism and civil rights, peace movements and respect for life, creation, spirituality and god himself. 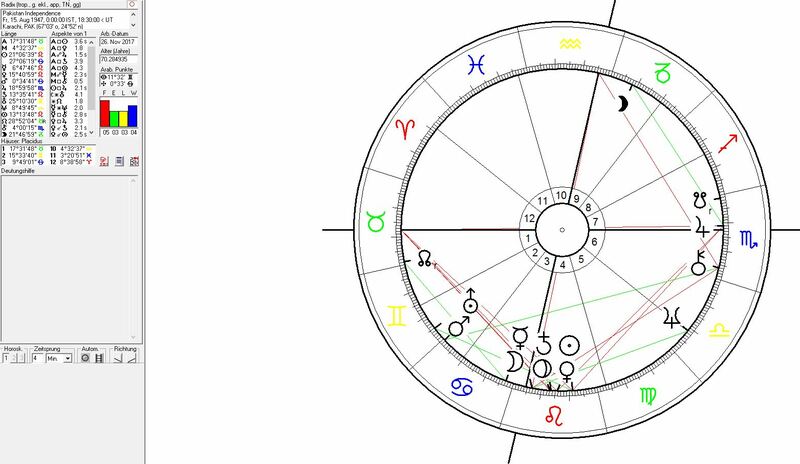 The current situation occurred while Mercury is about to join Saturn while approaching the astrogeographic positons of Islamabad at 1°Capricorn. 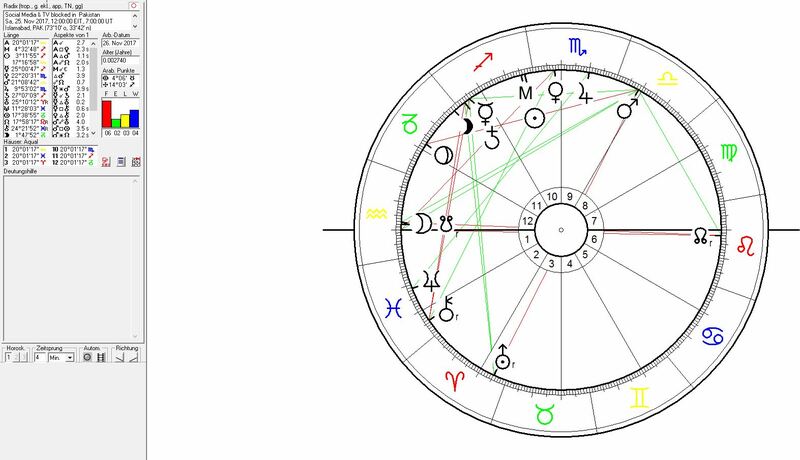 Saturn`s transit over the the last degrees of Sagittarius seems to have a 12th house plus a void of course effect on the stability of the Pakistani government. 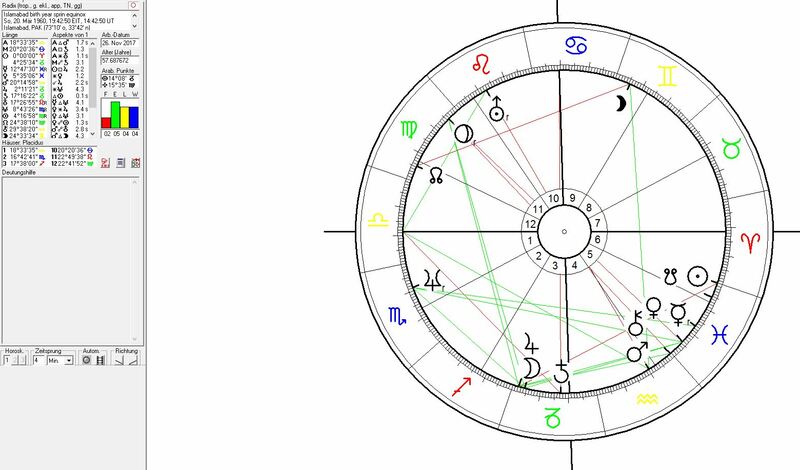 The strong resonance of transits over the first degrees in Capricorn with the Pakistani capital can be seen from the astrological chart for the spring equinox of the year 1960 when Pakistan`s new capital was founded and built. 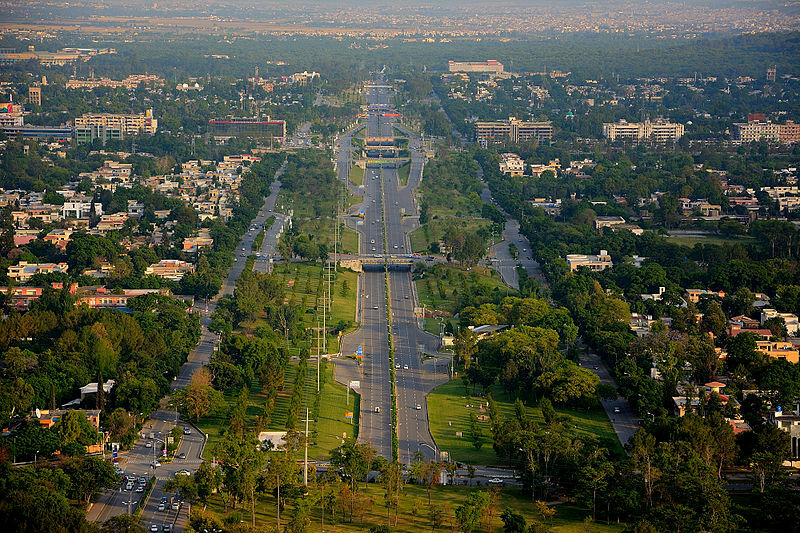 Islamabad was founded in a year when Saturn was in transit through Capricorn the sign of government institutions, administration, stability. laws and efficiency of administration. The spring equinox saw a Moon-Jupiter conjunction over the astrogeographical position of the area of the new capital – an extremely positive and beneficial constellation. The capital was designed by Constantinos Doxiadis a greek town planner and architect born on 12 May 1913 with Jupiter on 17°Capricorn and Mars conjunct the North Node Rahu on the first degrees of Aries the zodiacal sphere of new beginnings. Mars stood for the initial moment of conception (0°Cancer) and the start of emotional self-identification with the new country. The opposition of Mars indicates that the newly built capital under the name of god is in some ways an answer to the process of emotional individuation, tribal emotionality, nationalism, patriotism and also to individual hate and anger – which is also an important aspect of Mars in Cancer. In that sense Islam (-abad) – or say refering to god – would relate to the purpose of stopping hate and hateful projections and not stimulate them. This indicates that the positive purposes in the construction of Islamabad was an attempt to regulate and control the ethnical, political, religious and multicultural diversity and antagonisms within the country and even the destruction and suppression of spirituality through cthe instrumentalisation of religion for personal hate, anger and lust for murder. ← Devil´s Garden as a Hoodoo (who do) school!